Budapest is home to some of the best restaurants in the world. There are countless eateries, cafés, and bistros, all bragging about serving excellent food. But finding real authentic eateries that are also a good value for your money is difficult. With such a plethora of choices, it’s easy to get confused and fall into a tourist trap. Especially when you don’t know any locals. I know it from my own experience. Despite having friends and family in Budapest, I still had a fair amount of culinary disappointments in this big city. With that in mind, I decided to put together a list of the best Hungarian restaurants in Budapest. Hope that my short reviews will give you some idea about what to expect at each one of them. 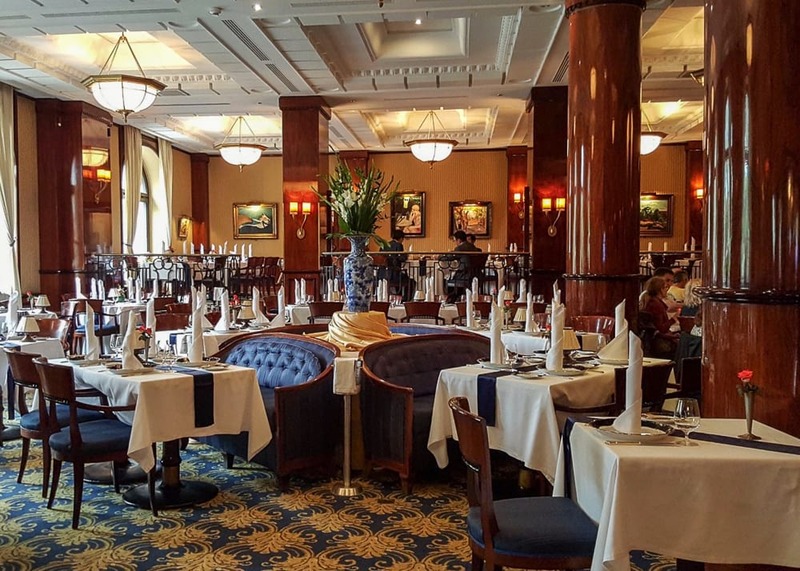 Gundel is Budapest’s most famous restaurant. It is also one of the oldest ones. 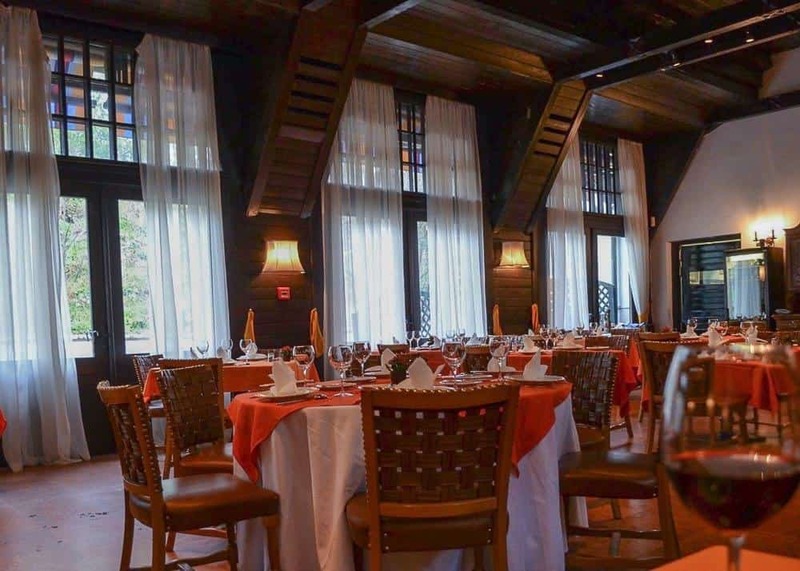 The restaurant has been standing proud at its current location for over 150 years. Gundel has an old culinary tradition and serves some of the most delicious Hungarian dishes that I have ever tasted. You can order à la carte, or a prix fixe menu (with up to eight courses). Each corse is paired up with the wine that best compliments the food. The restaurant also has a gypsy band that plays a wide variety of music, from old Hungarian folk songs, to waltzes and modern hits. Excellent food, good service, nice atmosphere, but very high prices. A dinner for two may cost anywhere from $450-$600, depending on the kind of wine you order. On the downside, the food portions are rather small, so you are more or less forced to order more courses if you don’t want to leave with an empty stomach. But I guess you don’t go to Gundel to eat, you go for a culinary experience. Dress code is high end casual. Don’t show up without a blazer! Address: 14th district, Gundel Károly street 4. If you find yourself in Budapest Old Town on a beautiful summer evening, give the Fishermen’s Bastion Restaurant a try. Perched high up on the wall of the Fisherman’s Bastion, this restaurant will spoil you with a royal interior and the best location in town. Great panoramic city views and live gypsy music. In summer you can enjoy a drink on the terrace. 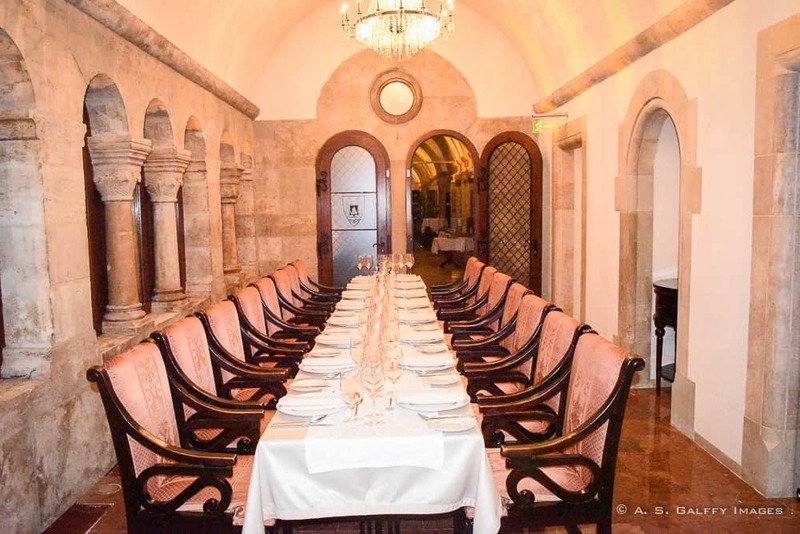 The central section of the restaurant features the Knight Hall, with a round expandable table that can accommodate a party up to 25 guests. This bistro style restaurant is very popular among the locals and almost totally unknown to the visitors. Located in a residential neighborhood in Buda, Csalogány 26 is so well hidden that you can easily miss it. Don’t be fooled by its unassuming appearance and non-ceative name (named after the address). 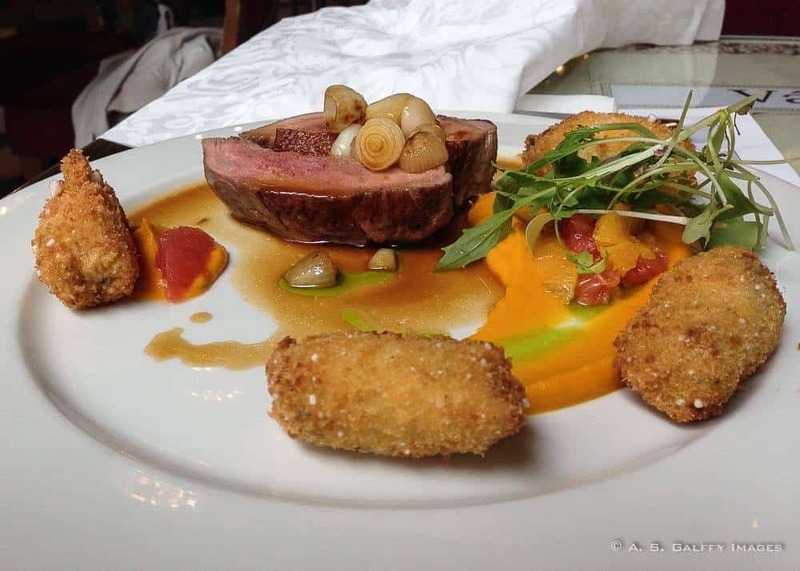 Csalogány 26 is one of Budapest top ten restaurants, despite its remote location. The Owl’s Castle is a cheaper version of Gundel (has the same owner and shares a kitchen with the much more expensive establishment). 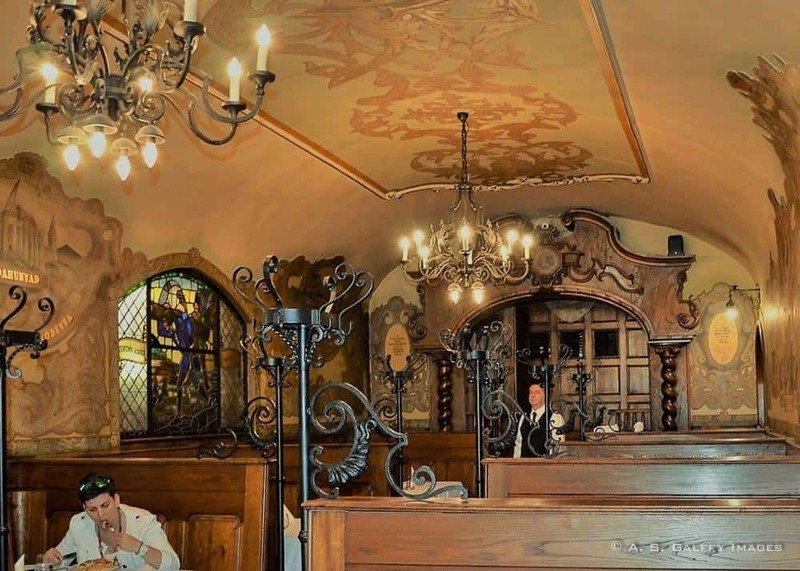 The restaurant which is exclusively run by women, is located just a stone throw away from Gundel, in a reproduction of a Transylvanian house from the 19th century. The restaurant serves both lunch and dinner and also has a patio that is opened during the summer months. Matthias Cellar is one of the oldest and most traditional restaurants in Budapest. The restaurant was named after Matthias Corvinus, one of the most beloved Hungarian kings. The restaurant is located in a former brewery, very close to pedestrian Vaci utca right next to the Danube. Although very touristy, the restaurant preserved its atmospheric authenticity. This little tavern located in the downtown area close to the Comedy Theater, is one of our favorite pubs in Budapest. 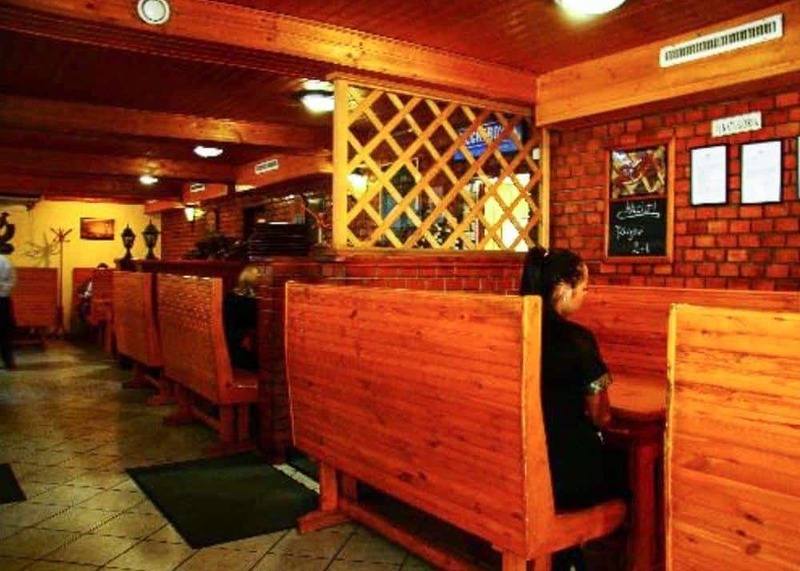 The pub serves excellent authentic Slovakian and Hungarian cuisine at very cheap prices. Their signature dish is “sztrapacska” (potato dumplings with sheep feta cheese and bacon), but they also serve an excellent Goulash, soups, grilled meats and deserts. 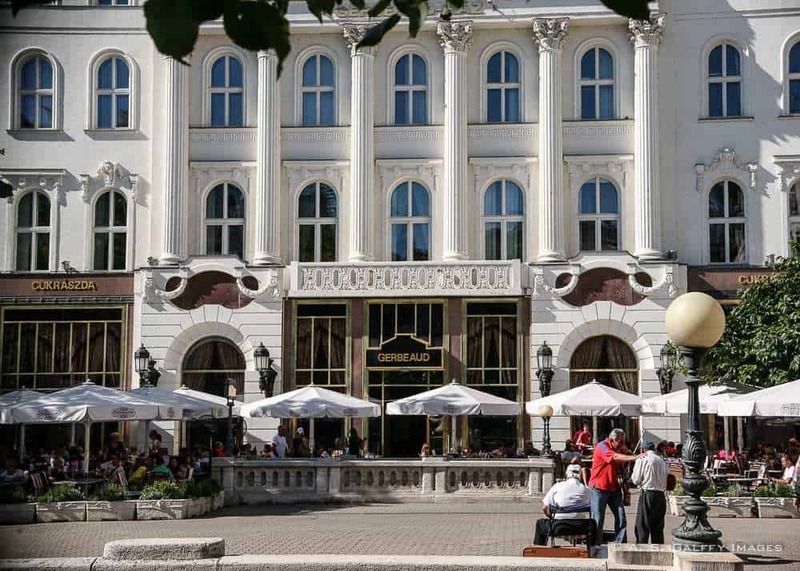 Located at Vörösmarty Square (at one end of the pedestrian Vaci street), Café Gerbeaud is one of Budapest’s landmarks. 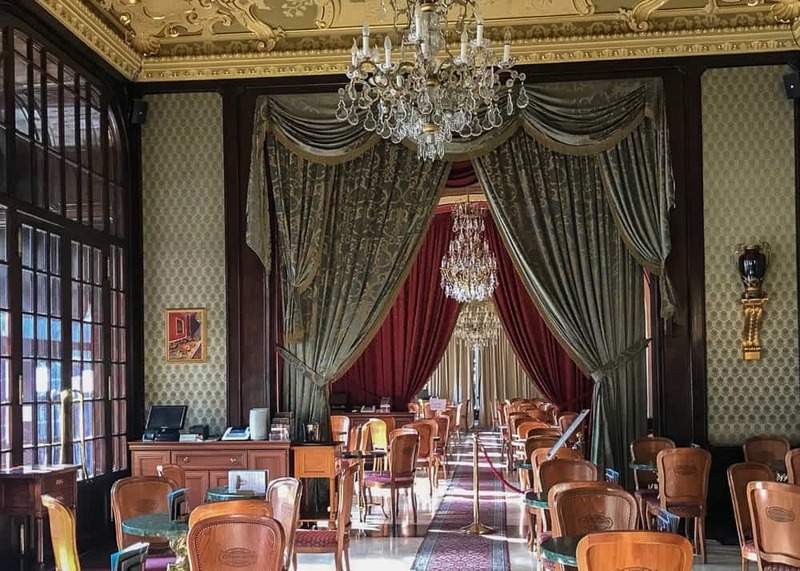 If you asked me a while ago, I would have told you that no visit to Budapest is complete without savoring a Sisi cave (Sisi coffee) at the opulent Café Gerbeaud. But today the legendary Gerbeaud tries hard to hang on to its old glory. Unfortunately, what was once Budapest’s finest café and the meeting place of the city’s elite, became a touristy, overpriced, and mediocre place. Still, if you want to see one of the most traditional coffee houses in Europe, you should stop for a visit. The grandeur of its chandelier-lit rooms covered with red velvet may justify your money. Too bad the quality of the service is lost. I used to love Gerbeaud. Another historic café in Budapest that served as the gathering spot for famous artist figures of the time is Café New York. Built at the end of the 19th century, this architectural gem went through some bizarre transformations over the years. During the Communist era, the place became a sporting goods store (of all things!) In 1954 it reopened as a restaurant and was renamed Hungaria. Only in 1989 it became a café again and was reopened under its current name. Located on the ground floor of the New York Palace hotel, the coffee house displays a rich and opulent decor made of marble, bronze, silk, crystal, velvet. The place is over the top luxurious! And still maintains the old time tradition of serving coffee on silver trays. 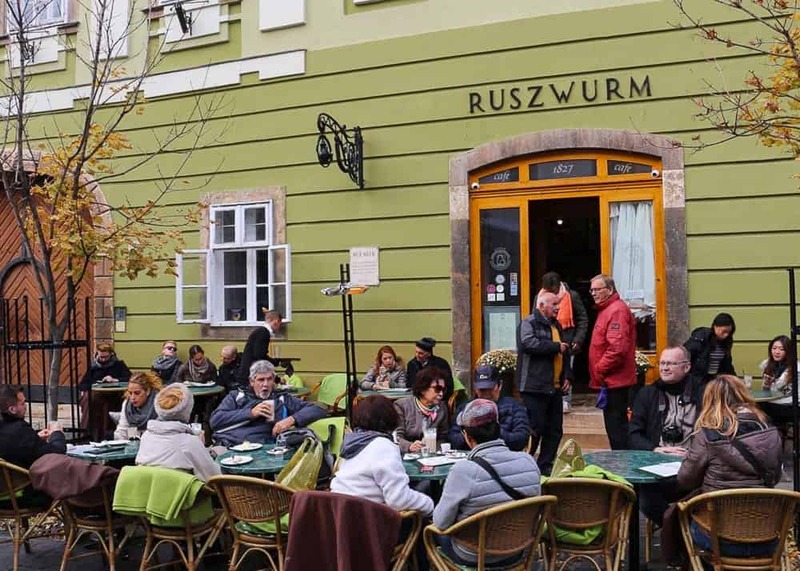 Ruszwurm is one of my favorite spots in Budapest. Their delicious pastries and coffee make your mouth water. 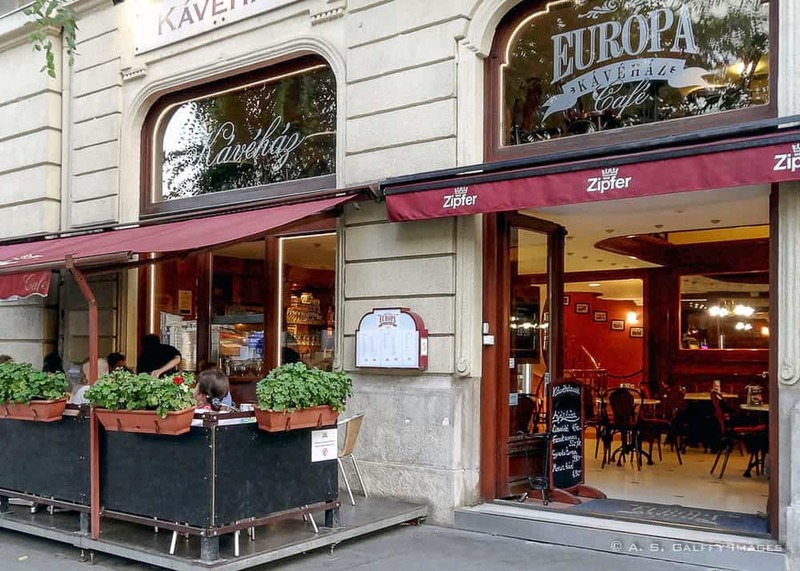 Located in the Buda Castle area, the 187 years old tiny little café still operates with great success. Ruszwurm is owned by the Szamos family, a famous confectionary dynasty. Europa Café is another very pleasant coffee house, with bot inside and outside sitting. Located on Szent Istvan körut opposite the Comedy Theater and just a few steps from Margaret Bridge, the café has a big selection of pastries and sweets. Europa Café is a popular spot for the locals. The atmosphere is reminiscent of the small Parisian cafés where the old timers meet to catch up with each other. 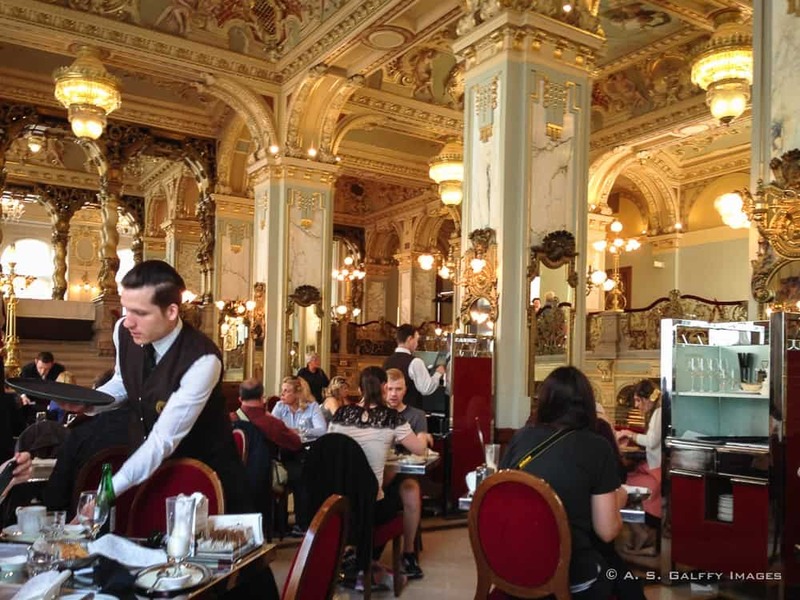 Did you visit any of this great restaurants and cafés in Budapest? Which one was your favorite. Ha,ha,ha, I hear you Suze. These Hungarian names are really hard to pronounce, but the food they serve is so tasty! Yea, their spas are great indeed, Victoria. But the food is even better. Looks like some really classy places here! I can't wait to get to Budapest and chow down on some of these amazing eats. I believe you won't be disappointed, Kevin. Everything about your experience in Budapest is magical. Looks interesting. Further photos are really beautiful. Hope you have a great fun! Yum, many of those sound really delicious, do you have a favorite? Will have to keep this list in mind whenever we get to Budapest! Wow, what beautiful restaurants! I'm hoping to visit within the next year, I'll have to keep this in mind! Thanks so much for the great reviews. I loved the food in Budapest but I can't remember the restaurants we went to. Hmmm.... you probably didn't go to any memorable ones then. I loved exploring Budapest’s food scene. Looks like I need to go back and eat some more. I can't imagine Café New York as a sporting goods store but I guess the communists could. I like the opulence of many of the restaurants. Thanks for honest opinions on the quality and value of the food options in Budapest. This information is invaluable to the traveller. Thank you Rhonda. I'm glad you appreciate my honesty about that. I like to tell people what they can expect when they go to a place a recommend. Oh, boy! This is perfect or my upcoming trip to Budapest! Pinning and studying (mouth watering!). Haven't been to all of these, but I agree with you on Gerbeaud. It used to be our favorite place to eat and especially have some traditional Hungarian pastries and perfect coffee... but the last few times we visited, it felt different, it lost something. The old "call something paradise, kiss it goodbye"; it became too well-known, too touristy. Your list is great, thanks for putting it together. Thanks, Emese. I am with you on that. Google became a little touristy too. This is partly because of the huge prices they charge for food. Locals can't afford to come there anymore, unless is a business meeting and the employer pays. Pretty sad. They all look enticing -and interesting! I think I'd have to be wary of eating too much, especially the sweets. And I think I'd definitely love the place with the gypsy band. Now I want to dress up in my best 1920s-style dress and have a meal at Gundel! It looks like the dining room is straight out of the old world and you'd totally feel like you were in another time if you visited. Hahaha, you are right. Gundel feels like that kind of place. This is a great resource for visiting Budapest! I think Mátyás Pince is at the top of my must-visit list with the gypsy music and folk dances! And then Ruszwurm, of course! Good coffee and pastries? Count me in! Yea, I hear you. I'm the same way: I love sweets. I'm not much of a foodie, but I'd eat at any of these places! I am like you..the sweets get me every time. Great list! Thanks! I have a friend who lives in Budapest and she said you did a wonderful job on this list! There are a few places that you mentioned that she had already added to our list of things to do when I visit. This one goes in the travel folder! Thank you, Mia. I hope you'll enjoy some of these place on your next visit to Budapest. Have been to Budapest before but never really was on the look out for restaurants &amp; cafes. It is however one of the cities that I'd love to go &amp; visit again for a longer period so this should be handy! Definitely won't be going for a USD500 dinner though, even if it's for two ? I absolutely love the food in Budapest - I couldn't live there because i'd eat all of the delicious cakes all of the time. I remember going to Café Gerbeaud and our hotel was next to Cafe New York. Well I am definitely set for places to eat when I visit Budapest someday. Thanks for sharing your expert knowledge on this Anda. I'll be saving this post in my travel file for when I one day get to this beautiful looking city. Hope you'll get to visit Budapest, Jen, and eat in some of these fine places. These look amazing. I will mark this for when I go to Budapest. I think Szlovák Söröző will be my first stop. Budapest is definitely on my bucket list! This list looks great and I love the architecture of every place. Definitely bookmarking! I haven't been to Budapest yet so this is a great list on places we should check out. Love that these are less touristy places. I'm terrible. Even though I lived there for a couple years I never made it to any of these. I went to a networking even at the New York Hotel which had food so I sort of ate there but not really. I've heard of most of them though. Great list! You should try to visit one of these restaurants if you go back to Budapest. What a great list of restaurants! I love the ceiling decor in Mátyás Pince. I'll have to make sure to go try some these when I travel to Budapest. Excellent pictures! I love how you really bring out the character of the sites you photograph.